November 19: The 10th year students have opted for adopting the Code. 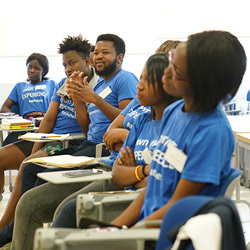 October 15: Ashesi students traveled to Harvard’s institute in Dubai. June 23: Three seniors win The Scholarship, Leadership & Citizenship Award. To kick-start the school year, student leaders at Ashesi participated in the inaugural Leadership Summit organised by the Office of Student and Community Affairs. The election period which saw a voter turnout of 70%.